Around 2011, many industry analysts were predicting strong growth in enterprise video conferencing market revenues. The consensus seeming to reach over $5B by 2016. The reality has probably been a bit below that. There has been a dip in total market sales over a couple of the intervening years, and certain video endpoint technologies (telepresence and desktop systems) have not done as well as some hoped or expected. This does not mean video overall is unpopular. True, it seems to be taking some people a bit longer than anticipated to ‘get over’ being on camera. There also remains a persistent uncertainty that everything will always work smoothly, especially when external video connections are involved. However as consumers, the younger generation has casually accepted video, whilst the older generation uses video to stay in touch with distant relatives and those in between are getting accustomed to less formality at work. Together this should mean that video will become more widely acceptable as a tool in the workplace. So why not exponential growth in revenues? Cost reduction is potentially a reason, but also adoption is being held back. Not by lack of bandwidth or usability, but by lack of access and application. However, the market is undergoing a series of changes which will improve matters. The proprietary and sometimes clumsy nature of engaging with video conferencing systems is evaporating fast. Interoperability and ease of use have been tackled on the technical front. Subscription or operational models of pricing have eased commercial adoption. Better, smarter, high resolution cameras have become a low-cost desktop accessory and high quality audio is more commonplace. While fully immersive telepresence systems have sold well in certain quarters, investment costs make them exclusive to high end markets and a narrow group of relatively infrequent users. Elsewhere much video technology is moving into everyday, rather than exceptional, use. However, it is not hardware advances that is making video progress, but software, services and end-to-end applications. Increasingly, video capability is being delivered as a cloud-enabled service. This also allows it to be accessed and used anywhere often ’embedded’ to enhance applications. This is far better than being seen as a separate medium to be unified with other forms of communications. Video is shifting from being focused on specialised endpoints delivering ‘souped up’ phone calls over dedicated network capacity, to being something that can seamlessly add value to any business process, anywhere. This is no longer video ‘conferencing’, but video enhanced applications using open standard technology and networks. These applications are not simply about establishing a connection or ‘communication’, but reaching a ‘conclusion’. The idea is to get something of value accomplished. This might be a broad or horizontal application, such as ‘better collaboration’, or a vertically aligned one, such as tackling crime. Better collaboration is not just people simply communicating on a pre-arranged schedule – conferencing – but all participants enjoying ad hoc rich media involvement and being able to focus on and work towards a goal. This implies access to video by anyone, anytime, anywhere on any device. Plus it must be seamless. This can be best accomplished by shifting all the complexity into the cloud and smartly integrating to provide as close to a simple, reliable and zero touch experience as possible. Many of the traditional business video conferencing players have been moving towards cloud in the last couple of years. Other companies have focused there from the start. The recent integration of Blue Jeans Network’s onVideo and Primetime products with Workplace by Facebook indicate a strong commitment to video on its enterprise platform and increases the pervasiveness of video by embedding it in other applications and delivering as a service. There are others too in the enterprise video software and cloud camp, such as Vidyo and StarLeaf. And then there is Skype. Microsoft has clearly moved this proposition from a consumer play into enterprise video contention. It is also working closer with industry stalwarts like Polycom, plus prompting integration and interoperability programmes with the likes of Cisco and Lifesize. Video conferencing may have reached an inflexion point, but video innovation and adoption is showing no signs of slowing. 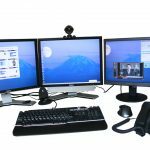 Enterprises should no longer view video as a tool for a set group to do ‘conferencing’ with dedicated equipment. It is something to be delivered anywhere and everywhere, integrated as a service to provide organisational value and individual ease of use. To deliver this, enterprises should look to the cloud for video, but also look to those who deliver it as a solution to a business problem and not simply a way to add head and shoulders onto a phone call. Video conferencing may not strictly have peaked, but the use of video is entering a new phase. Good commentary, thank you. You are right, the use of video is entering a new phase that more effectively supports the growing demands of a mobile workforce. Next gen workers (not only millennials) are looking for next gen tools to support the impromptu open space meeting environment that is difficult to support with traditional solutions. New applications and new attitudes are making the natural evolution of video conferencing just as exciting as ever!